ROME, Italy (CNN) -- Pope Benedict XVI preached and greeted well-wishers Sunday, three days after breaking his wrist in a fall. 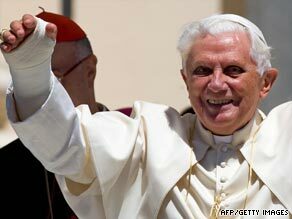 The pope celebrates mass with his broken wrist in plaster. He held the text of his speech in his uninjured left hand, then circulated among the crowd who came to hear him in Romano Canavese, pictures from the northern Italian town showed. The 82-year-old pope had surgery on his right wrist after he fell Thursday night, spokesman Father Federico Lombardi told CNN on Friday. The pope is "learning" to live with his cast, Lombardi told Vatican Radio. The most painful aspect of the incident for Benedict is having to give up writing by hand, which he had intended to do frequently during his annual vacation Italy's Val d'Aosta region, Lombardi told the official Vatican station. "I know that here, too, in the Ivera region, many families are facing economic hard times due to a lack of work," he said, referring to the now-defunct Olivetti typewriter manufacturer in the region. "Dear friend, do not be discouraged," he added, according to Agence-France Presse. "Providence always helps those who do the right thing and seek justice; it also helps those who think not only of themselves, but also think of those in worse situations than their own."